Thanks to The Rock and MikeM for providing clues that may eventually lead to the identification of this Mystery Ship. The stack symbol indicates that the tug belongs to the U.S. Army Corps Of Engineers. The bow reads “Corps Of Engineers.” Unfortunately, that isn’t the name of the vessel as many Army tugs were marked in this manner. 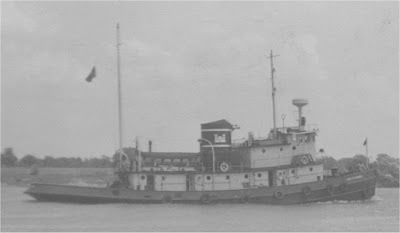 However, research indicates that it is one of four tugs: LT-4 Major Wilbur F. Browder, LT-5 Major Elisha K. Henson, LT-7 Major George W. Hovey or LT-18 Major Emil H. Block. Since all four tugs are nearly identical in appearance, this vessel, for now, will remain a Mystery Ship. Corp of Engineers, but which one? "City of _____"? or is it the Owen M. Frederick? I'm surprised that it has radar. When would tug boats start having radar installed? Thanks for the clues! The Rock is correct; the stack symbol is that of the U.S. Army Corps Of Engineers. Mike was close with “City of ___?” It actually says “Corps Of Engineers.” Unfortunately, that isn’t the name of the vessel as many Army tugs had that on the bow. However, research indicates that it is one of four tugs: LT-4 Major Wilbur F. Browder, LT-5 Major Elisha K. Henson, LT-7 Major George W. Hovey or LT-18 Major Emil H. Block. Since all four tugs are nearly identical in appearance, this vessel, for now, will remain a Mystery Ship.